Getting back into the groove of work means sacrificing the blog, just a little bit…sorry! Must admit I’ve fallen into a food rut. You know the kind where you prefer to eat the old and familiar versus the new and happening? It’s not as though I’ve not tried to hit those happening places such as that latest burger bar but the food there was dismal, it didn’t even inspire me to whip out the DSLR to snap a picture of it. Better not talk about failures but talk about something so much better i.e. Singapore’s latest import that is making us eat our words and admit that, Singapore food is actually rather decent. Technically it is Heng Hwa food and not Singaporean to say the least but the restaurant’s origins hail from that tiny red dot down south. It is not the first time we have been invaded by the Singaporean restaurant chains (one remembers Crystal Jade’s delicious openings) but late last year, early this year saw a huge influx of them trooping up north to our capital. First, it was Paradise Inn in Sunway Pyramid. Then Soup Restaurant that serves Samsui homestyled fare and this place Putien started their business in the refurbished 1 Utama Shopping Centre’s old wing. I’ve dined at this place twice and noticed how packed it is every time. Even when I walk past it to patronise other places, there is always an eager queue of people at its doorstep and the hidden restaurant within seems to heave with people during lunch and dinner time. Their key is consistency – everything is rather well cooked. 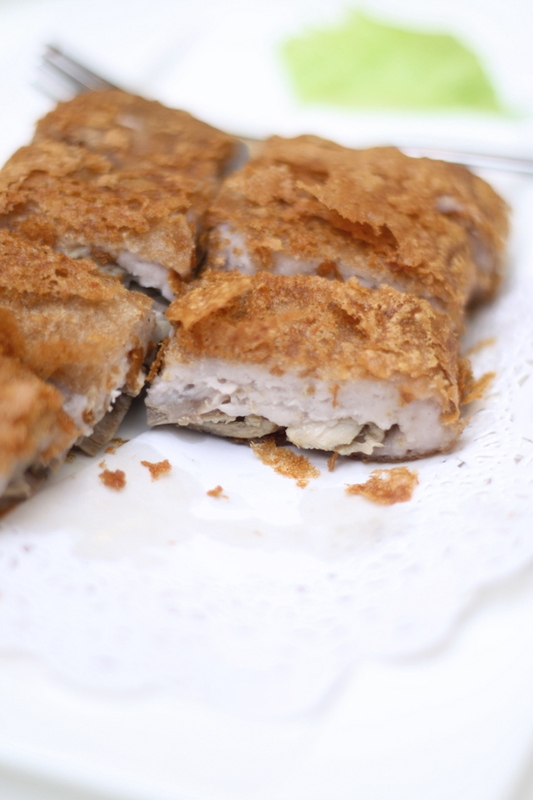 Also helps when you serve up a rarely seen cuisine like Heng Hwa that makes it stand out among our usual Cantonese, Hokkien and Hakka cuisine. For those whose tongues are more accustomed to robust flavours, this place is definitely not for you since their flavours are delicate and light. 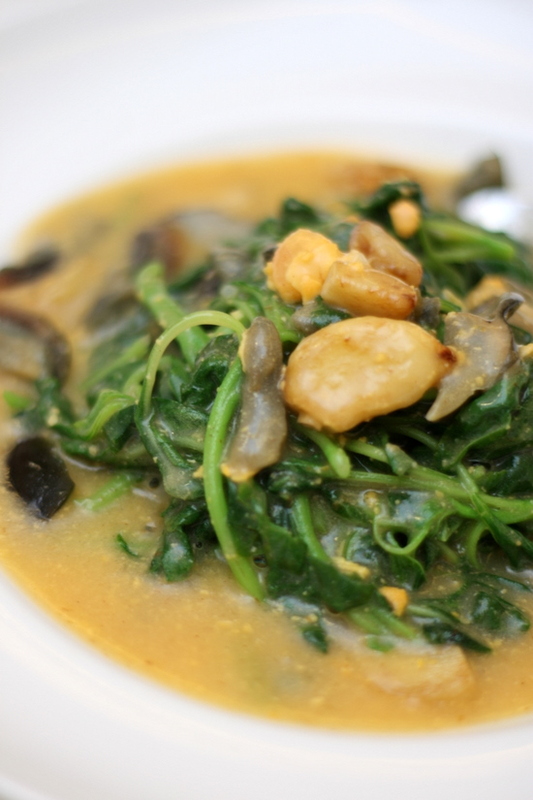 I found certain dishes exceptional here such as the classic Chinese restaurant dish of poached spinach with superior stock. It is served with a triple whammy of eggs here – the stock is infused into a brilliant orange with creamy salted egg yolk and egg, while niblets of century egg complete the whole trilogy of cholestrol-highness. Really so lovely and decadent that those who don’t eat greens really do not know what they are missing out. The cuisine is a humble one that uses lots of root vegetables such as yam, a big favourite of mine. I love the crispy yam with duck that is like a grown up version of the wu kok, with its crispy filigree coating and chunks of duck meat in between. The briny seaweed as a starter is also rather nice and tangy. 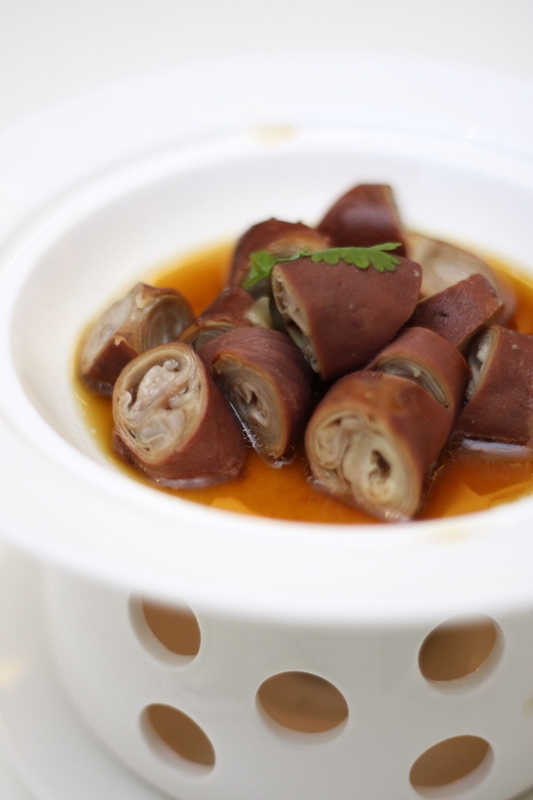 There is also the decadent pig’s intestine – tender niblets of the offal all rolled up in so many thousand layers that it is wonderful when bitten into. Another favourite, not pictured here is the deep fried pig’s trotter – just the right crispiness mingling with the soft collagen that begs you to get the hands all dirty and eat it with your fingers. We also sample the sauteed french beans that is lovely and crunchy. 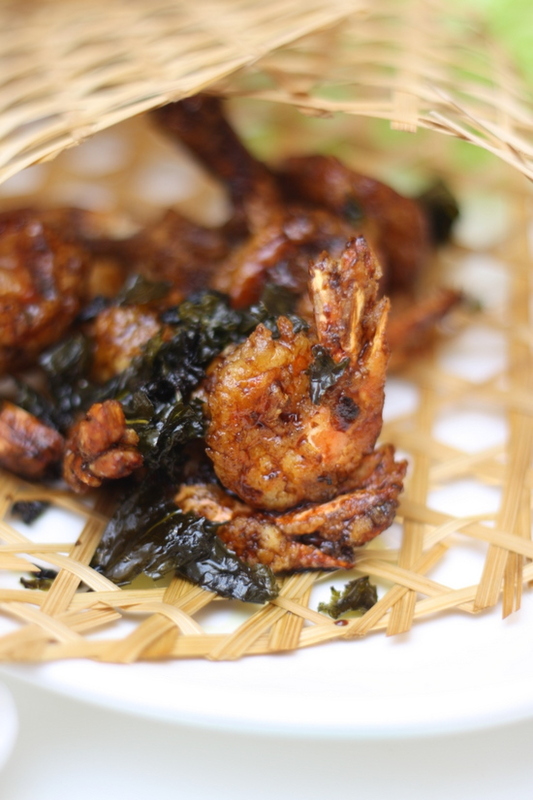 There is also prawns with tea leaves, a kinda forgettable dish that leaves us not much of a food memory. I’m no fan of their o chien either since it is rather chewy and dry. The Heng Hwa fried beehoon is rather nice, beautifully fried with each strand absorbing the rich pork stock it is cooked in. 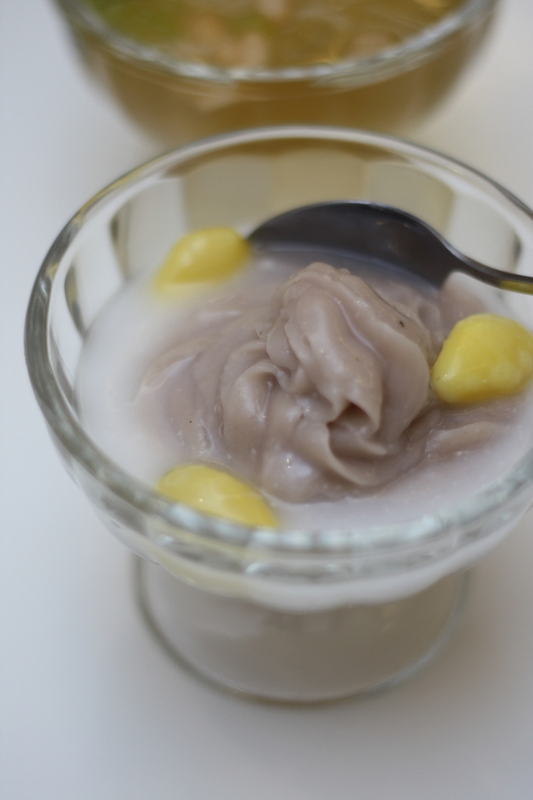 Dessert is simple…the age old classic of soft yam with gingko – a decadent treat of silkiness mingling with sinful lard. 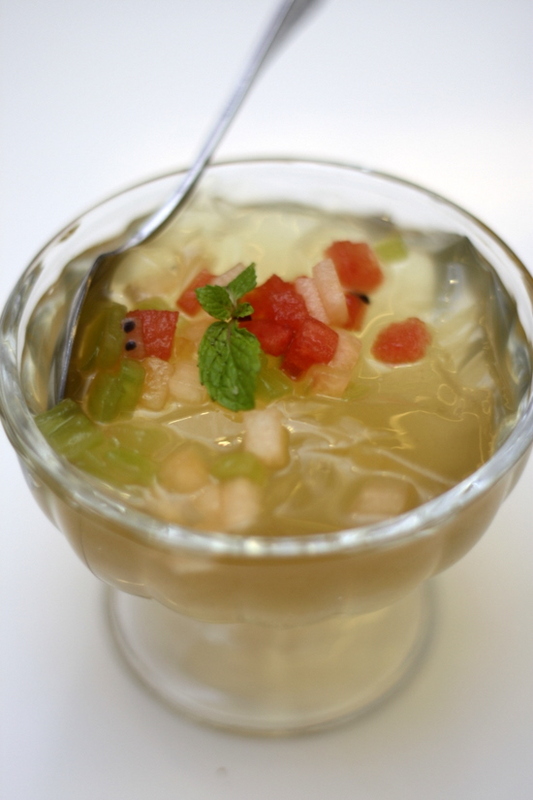 There is also the cooling and refreshing lemongrass jelly. I reckon I will keep returning to this place as it is my new Chinese comfort food. I also love the lor meen here with its silky white noodles and the lusciously sweet broth dotted with prawns, vegetables and pork.